H and V Press Release Hanson Cooling Services. Air Conditioning Unit Installation Northamptonshire, UK, Mitsubishi Heavy Industries. 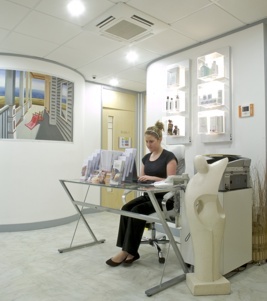 Installer Hanson Cooling Services has fitted two Mitsubishi Heavy Industries' three-pipe VRV systems at a High Wycombe medical spa. 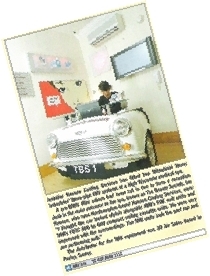 A pre-BMW Mini Saloon had been cut in two to form a reception desk in the main entrance to the spa, known as the Beauty Society. 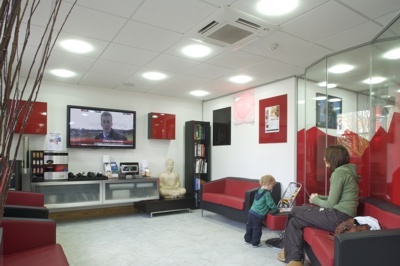 Ian Hanson, who runs Northampton-based Hanson Cooling Services says: "I thought the car looked stylish alongside MHI's FDK wall units and MHI's FDTC 600 by 600 compact ceiling cassette units. We were very impressed with the surroundings. The MHI units look the part too and are performing well." 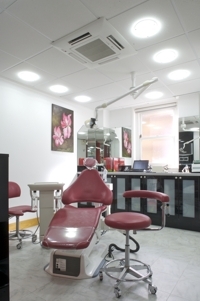 The distributor for the MHI equipment was 3D Air Sales in Purley, Surrey. Hanson Cooling Services Ltd, Slade Farm, 26 High Street, Harrington, Northamptonshire. NN6 9NU.